Speaker 1: In Martinsburg, the citizens celebrated the 22nd Amendment on Wednesday morning, but in their own way. WDM’s Kaylin Morris has more. Philip Blumel: Maybe we’re onto something here. 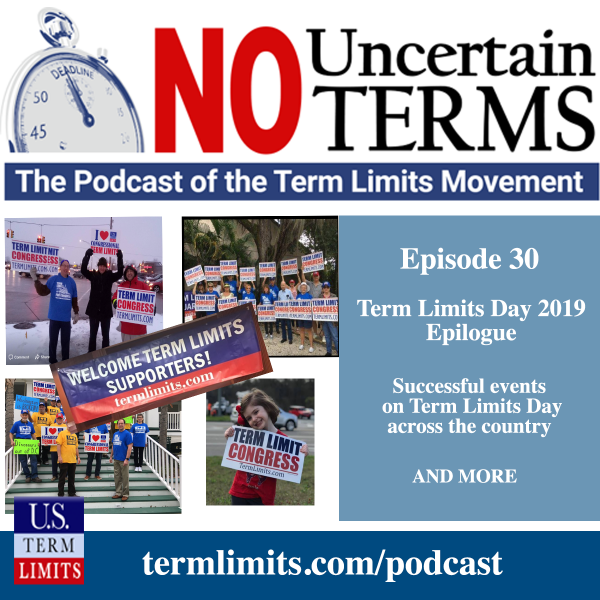 Hi, I’m Philip Blumel, welcome to “No Uncertain Terms” The official podcast of the Term Limits Movement for the week of March 4th, 2019. Operator: Your sanctuary from partisan politics. Philip Blumel: We were startled by the popularity of the first ever Term Limits Day last Wednesday. Successful events were held in pockets around the country, and we got some unexpected air cover at the national level. Stacey Selleck, Digital Director at US Term Limits, has been tracking the action and its fallout. Hey Stacey. Stacey Selleck: Hey, great to be here, Phil. Philip Blumel: So before we get into all the details and the big picture about Term Limits day last week. I want to ask you personally, how did you celebrate Term Limits Day? Stacey Selleck: I organized a group in New Port Richey, Florida, and we had about 14 attendees there. I gave them some swag, t-shirts, hats, literature on Term Limits, and of course in Florida, we have the senate and house resolutions going through for school board term limits. Stacey Selleck: So I talked a lot about that. And then we took some pictures with some signs and things like that. It was a fun event. Philip Blumel: It’s great. I know that all of us, as you’ve been collecting this information and we’ll go through some of these events, everybody’s doing something different, you know? Here in the other side of the state what we did was we got the names of volunteers over last several weeks who wanted to show support by putting a yard sign in a front yard. We had some volunteers go around and drop signs in all these people’s yards. And 130 people asked for a sign, and so we didn’t litter the intersection with these signs, we basically just put it on yards. So, as people got up to go to work and come home from work that day, they saw that their neighbors support this idea. Philip Blumel: We also put a banner up over the inner pass on, busy I-95, during rush hour. And that said “Happy Term Limits Day, February 27th” Several people took pictures of the signs that were dropped in their yards and then sent that around to all their networks, saying “Happy Term Limits Day, February 27th.” And. Stacey Selleck: As a matter of fact I went yesterday, I drove up to another town north of me. And I saw a term limits sign there. Philip Blumel: One of my favorite things that I saw, and that come across my feed. Was, in Alabama one of our activists held an event. Where the state auditor, Jim Ziegler attended. And they had a live band, and Jim sang. A version of “My Cheatin’ Heart” the classic Hank Williams Senior song. Patsy Klein did a version, Elvis Presley did a version, Ray Charles did a version, the killer Jerry Lee Lewis did a version. Here’s Jim Ziegler doing it. Jim Zeigler: You’ll walk the floor, the way I do. Your cheatin’ heart, will tell on you. Scott Tillman: This is Scott Tillman, the national field director with U.S. Term Limits. Giving you an update on our legislation and the U.S. House and Senate. We’ve had legislation introduced in both houses, this week senator Pat Toomey came on as a co-sponsor for SJR1, in the senate. Bringing our total number of sponsors and co-sponsors to eleven. In the House of Representatives we currently have HGR20, which has thirty-five sponsors and co-sponsors. Scott Tillman: Some interesting happenings this week in Pennsylvania. There’s a special election that’s going to be coming up, to fill a seat where the representative resigned due to health issues. That seat is going to be filled at a special election, there won’t be a primary race for this election though. Its going to be two candidates, one nominated by a group of Democrats and the other one by a group of Republicans in the district. There’s only one delegate for the Democratic side, there are however seventeen on the Republican side. Scott Tillman: Of those seventeen delegates, twelve of them have signed the U.S. Term Limits Congressional Pledge. Philip Blumel: Where a bunch of activists went up to the capitol and went door to door to wish their legislators “Happy Term Limits Day”. Stacey Selleck: And in Georgia they had a Senate vote going on as well, which was a surprise for us. So that was a really, a nice little icing on the cake for us. That we passed unanimously in the Senate Rules Committee. Philip Blumel: Hold on, lets back up. That’s big news. Philip Blumel: The Term Limits Convention bill, passed the committee in Georgia on Term Limits Day, last Wednesday. Stacey Selleck: And they went in there, to the hearing. Stacey Selleck: And gave public testimony. Philip Blumel: Oh that is tremendous. Philip Blumel: That’s a great way to spend the day. Philip Blumel: Yeah, no kidding. Well good, so we’re making progress in Georgia. Right on Term Limits Day, that’s awesome. Philip Blumel: Any other events we should point out? Individual events. Stacey Selleck: Yeah, well we had at least sixteen events in twelve states. Stacey Selleck: And of course, you know, whatever volunteer activities around as well. And so some of those states are Maine, New Hampshire, Maryland, West Virginia, that we mentioned. Michigan, there was the sign way of Kentucky. South Carolina had a really nice event with some colorful, beautiful, pictures. Stacey Selleck: Arizona had a good event, Alabama we mentioned. And actually there was a little surprise one in Colorado. Philip Blumel: I noticed also that there was an event in Kentucky, we had some term limit supporters there record some testimonials. Alan Bills: My name’s Alan Bills, from Owensboro, Davies County. I am definitely in favor of establishing term limits for Congress, simply because, when this country was founded. The men who formed this country were citizen legislators, they were not professional politicians. Many of them were lawyers, but most of them were other professions that they went back to, when they left congress or moved back to their homes. Even the writers of the Constitution, and the men who signed the Bill of Rights. Did it for the reasons of establishing a nation of citizens, not a oligarchy of a political group that never leaves. Alan Bills: And the situation we have right now, is that we have people, men and women. In Congress, who have been there for decades. And they get away from the people they’re supposed to be representing. They move away from them, because they’re so far removed, being in Washington D.C.
Alan Bills: And because of that, they don’t really know what’s going on in their own districts sometimes. Philip Blumel: My experience was this year that, everyone that heard about it was excited about it and wanted to be involved in it. So it’s really just a matter, like everything with term limits. Of getting out and engaging people and they will want to participate. Stacey Selleck: We did get some press coverage, of course, it helped that Rick Scott’s out there stomping for term limits as well. So there was some really good videos and he’s very helpful in promoting term limits. That’s part of his package, to fix a broken Washington D.C.
Philip Blumel: Right, he was just interviewed on a news program just last week. Again, talking about term limits. Rick Scott: Betty, I think we ought to have term limits. It was never supposed to be a career job, right? It was supposed to be, come from the private sector. You might come from journalism and go up there, for six or twelve years, and then come back. And bring your ideas, go see if you can implement them, then go home. Alright. Rick Scott: Now, there’s people up there you know, thirty five years. The thing is, most companies now don’t have pensions. Why do members of Congress have a pension? If they have anything, have a 401K, like everybody else does. So, don’t have a special class. Philip Blumel: Joe Scarborough, host of the Morning Joe program on MSNBC. Was once U.S. Representative Joe Scarborough, of the First district of Florida in the pan handle. He ran for an open seat and won in 1994, the year of the Contract with America. With term limits as it’s center piece. Swept Republicans to power for the first time in forty years. Philip Blumel: He was a self limiter. He served only three full terms in office. A couple years ago at a public speaking event, Scarborough was asked during the Q & A about this issue. Joe Scarborough: You know, I’m always asked “What is the one thing you learned in Washington D.C.? What’s the one bill, if you could pick, just one bill, what would it be?” You start with term limits. HR1 term limits. And the reason why is, and I had life experience here talking about “Dude I was one of the eleven guys, that told him it was time to go back to Georgia.” We had a coup against him, cause we thought that he had forgot why he was elected speaker. Joe Scarborough: Started spending too much money. Every single time, every time I looked around in these back rooms where we were talking. And we were actually putting our political careers on the line. Every time, all eleven people. I just looked around and I made a note, I’m a slow guy. Like I said, I went to University of Alabama. But, I picked it up after a while. And pretty soon it occurred to me, that all eleven of the people that were sitting in a circle with me. Willing to risk their political career. On overthrowing the most powerful guy in Washington D.C. at the time. Were all term limited. Joe Scarborough: We don’t have that now. Male DJ Voice: Wake up! Scott Tillman: Hi, this is Scott. And I’d like to let everyone know about some different events happening around the country. There are many political conferences taking place, all over the U.S. this year. These are events where activists go to network and learn. Some are for conservatives, some for libertarians, and some for progressives. U.S. Term Limits will be attending the Libertarian leaning conference Freedom Fest, July 17th to 20th in Las Vegas. We will also have a booth at the Progressive Netroots Nation conference, July 11th to 13th in Philadelphia. And we may even have a panel at Netroots. Listen next week for an update. We will also have a booth at the Western Conservatives Summit, which is at the Colorado Convention Center, July 12th and 13th. Scott Tillman: Listen next week to hear about additional events where Term Limits supporters can find us. Philip Blumel: So how can we judge how many people we’ve reached, or how our reach was expanded on this day? Versus other days. Stacey Selleck: Our Twitter impressions. Stacey Selleck: Sixty times, it’s unbelievable. Stacey Selleck: Basically there were two posts that did that, and the reasons why, I’ll tell you. Austin put out a phenomenal post, about why we selected that day. As you know, an anniversary of Presidential term limits. Stacey Selleck: Those really went, I mean for us it’s viral. Philip Blumel: That’s tremendous. So wait a minute, who are these four Senators? Philip Blumel: Who are the four Senators who re-tweeted our Term Limits Day Stuff. Stacey Selleck: Rand Paul, Rick Scott, Ted Cruz, and I don’t have the last one. Philip Blumel: Oh, well that’s the National Air cover I mentioned in the intro, that is fantastic. Now that really extended our reach, and that’s what Term Limits Day was all about. Philip Blumel: Well, that’s it for Term Limits Day 2019 and also for this week’s podcast. If you put a sign out in your yard for Term Limits Day, please keep it in your garage for next year. Put Term Limits Day, February 27th, on your calendar for 2020. Now that we have seen the power of this idea, you can bet it will be bigger and better next year. Philip Blumel: Stay connected with the term limits revolution. The first step is subscribing to the No Uncertain Terms podcast. Use the podcast app already installed on your iPhone, or use iTunes, Google Play, Stitcher, don’t miss a single episode. Philip Blumel: Thank you, we’ll be back next Monday. Operator: The revolution isn’t being televised. Fortunately, you have No Uncertain Terms podcast.